Data sets stores data and can combine and deduplicate rows. A dexi.io data set can be seen as a table in a relational/SQL database, a collection in a NoSQL database or a single sheet in a spreadsheet. A data set has a data type defining the fields for each row in the data set. Rows can be added (inserted), viewed, modified (updated) and deleted (CRUD). Data sets in Dexi have a feature, that in one sense, makes them more advanced than their SQL counterparts: the key, or primary key using SQL terminology, used to determine duplicate/matching rows is dynamically configurable - even after data has been created. 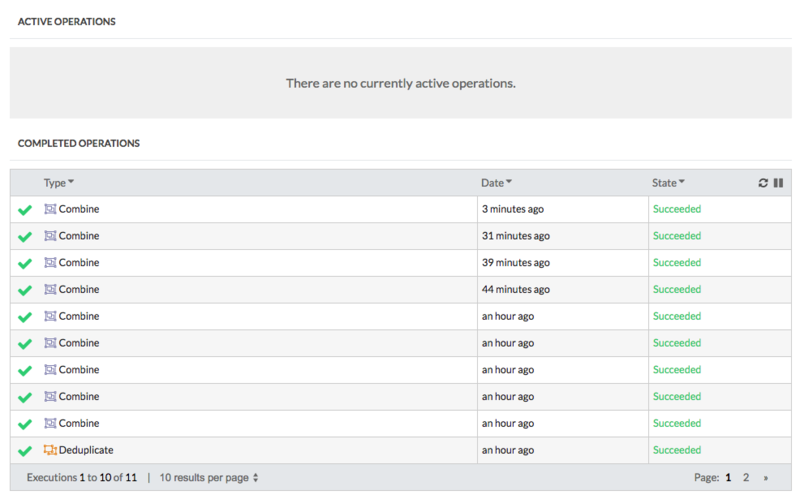 Data sets with this feature can be used for data deduplication (duplicate detection) and record linkage. Inserting row B into a data set containing row A using the appropriate key configuration defined on the data set (explained below) can automatically identify row B as a duplicate, or match, of row A, even though the values for Product Name and Display Size and not equal, e.g. the value for Product Name in row B contains a spelling error. We define deduplication to mean an operation that matches rows and removes duplicates within one data set and record linkage as an operation that combines two data sets (see sections Deduplication and Combine (Record Linkage) below, respectively). The details and the different variations are explained the sections below. The key configuration defines how the system matches rows, ie. determines duplicates. A data set key can thus be seen as primary key in SQL terminology. The comparison method - see Comparison Methods. The weight: a value from 1-10 indicating how important the value of this field is relative to the values of the other fields. score == 0: no match, or unknown row. The row is added directly to the data set as a new row. 0 < score < threshold: partial match. The row has the top x (currently, x=10) existing rows (if such rows exist) added to it as match candidates and the new row must be manually verified/matched to one of these existing rows. score >= threshold: perfect match. The row is added as a duplicate row with the perfectly matched row as its parent row. score == 1.0: identical row. The row is skipped (but it is recorded on the existing identical row that it was "touched"). A new row that does not have a high enough score (cf. explanation above) to be automatically matched by the system must be manually verified as a duplicate row. The match candidates are presented to the user and he/she selects, i.e. verifies, which match candidate best matches the new row. If one such row does not exist (or for some other reason), the row can instead be inserted as a new row. Manually verified rows are skipped when comparing rows. The motivation for this is to avoid the system automatically changing (merging/splitting) rows on which a lot of time and effort have potentially been put into. Any change to the key configuration and consequent operation can result in new rows that must be manually matched. See also Deduplication. No matter if a row was automatically matched by the system or manually by the user, such a duplicate row can be viewed as a child row to the existing row that was chosen as its match. Only parent rows should be seen as the data set's real data or master data. Only one level of matches are stored so in the example above the new C row will get A as its parent. As mentioned above, the individual values of the fields that make up the key are compared to produce a score for the row. Each comparison method can be configured to tell the system how dissimilar, or how "far apart", two values are allowed to be while still being considered duplicates/matching. String/text: used with a range to specify the allowed edit distance (Damerau–Levenshtein distance). Number: used with a range to specify the allowed distance between two numbers. Works both with integers and floating point numbers. - Contains: one image contains the other image. More comparison methods will probably be implemented in the future. When the key configuration changes the data set must be deduplicated. Changes in a comparison method, a weight, the threshold or which fields make up the key can e.g. result in rows previously being automatically matched now being seen as distinct rows or rows requiring manual matching. Because a deduplication operation can take a while for large data sets, the user will be asked if he/she wants to run deduplication immediately after the change to the key configuration. NB! Not running the operation immediately will cause the data in the data set to become inconsistent with the current key configuration and such a data set should not be used for purposes other than test/debug. 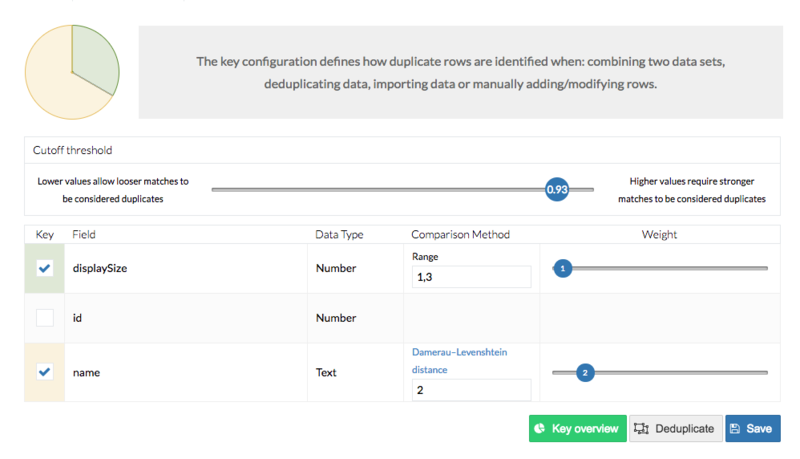 The rows of one data set can be combined (merged) into another data set using the combine functionality. The operation happens one row at a time and the key configuration is used as described in Key Configuration. On large data sets some operations can take a while. Currently this covers deduplication and combine. Importing a CSV and manually adding/modifying rows are not considered operations and will thus not appear on the Operations tab. - "Save row to <data set>"